"My son has been in pain for 14 years, watching doctors give up on him. He has been hearing people say that there is nothing left to do, and they suggest medical management for as long as his heart continues to beat, which may not be long. Imagine the life of this child – expecting death every minute. Would you ever wish it on anyone you know?" 19-year-old Diwakar does not remember a time in life when he was happy, healthy and normal. He has almost always been restricted to bed because of restricted cardiomyopathy. His swollen feet and bloated stomach do not allow him to stand or walk. Exhaustion is all he knows. 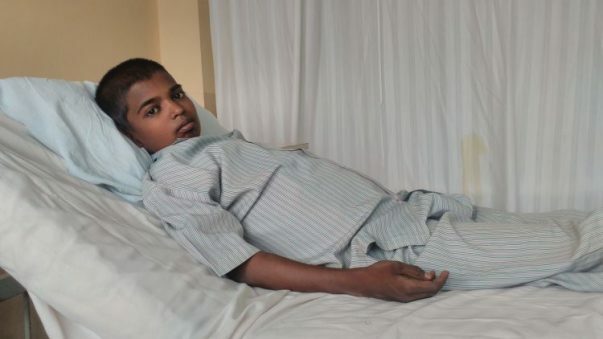 Diwakar’s condition has worsened over the past few weeks and for the first time, a cure is in sight. A heart transplant can not only save his life but also give him a future that can make up for all these years of suffering. It all began in 2004, when Manohara heard his son complain of severe stomach ache. He examined his stomach and was shocked to see that it had abnormally bloated. Fearing for his life, Manohar rushed Diwakar to a small local hospital which due to lack of facilities refused to admit the boy. They moved to a nursing home nearby where Diwakar was diagnosed with a heart condition. Unsure of the situation, the doctor referred him to Jayadeva. 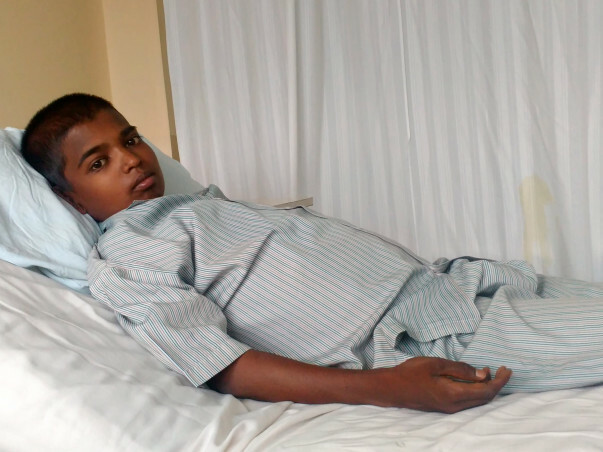 Amongst all the confusion, Diwakar needed an emergency surgery to fix a valve. A year later, his condition further deteriorated with increase in wall thickness. 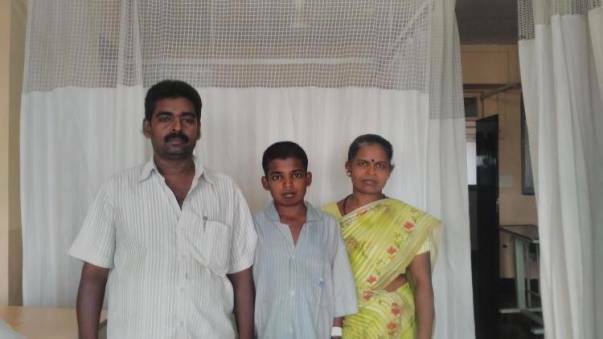 5 times a year the family Diwakar would need hospital intervention. When the idea of death is reinforced so many times, eventually it seeps in. 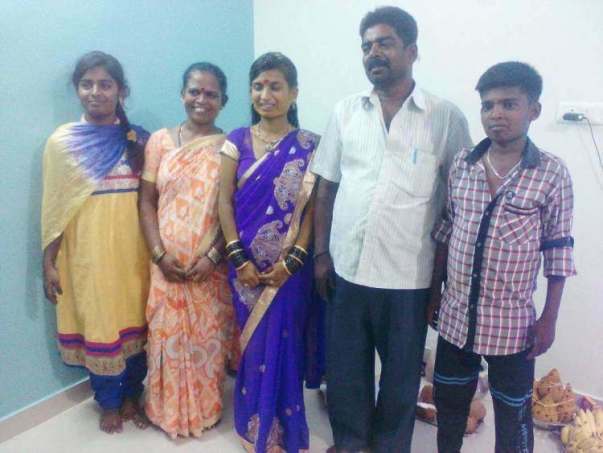 These parents discontinued Diwakar’s education when he was in 7th standard. They began to think about the boy’s future, and at the time it looked bleak. At the moment, Diwakar’s body is retaining water so much that he is allowed to drink less than 1 L every day, and his chest is weighing him down as the heart muscles tighten. He is very weak and needs a transplant to survive the year. Manohar is a painter. He makes Rs. 600/day and has two other children to care for. The money has always run out due to piling medical expenses. This father is not ready to give up on his son. He needs your help. Diwakar successfully underwent the heart transplant. However, there were a lot of post surgery complications. His body was too weak to recover from the severity. He battled hard for his life, doctors tried their best but could not save him. The family is in deep grief with their loss, withdrawn funds were utilized to settle down the hospital expenses. They are grateful for your selfless support. Diwakar is better now and he is undergoing the treatment. The doctors are running periodic tests to make sure that once the donor is located the transplant can be carried out right away. 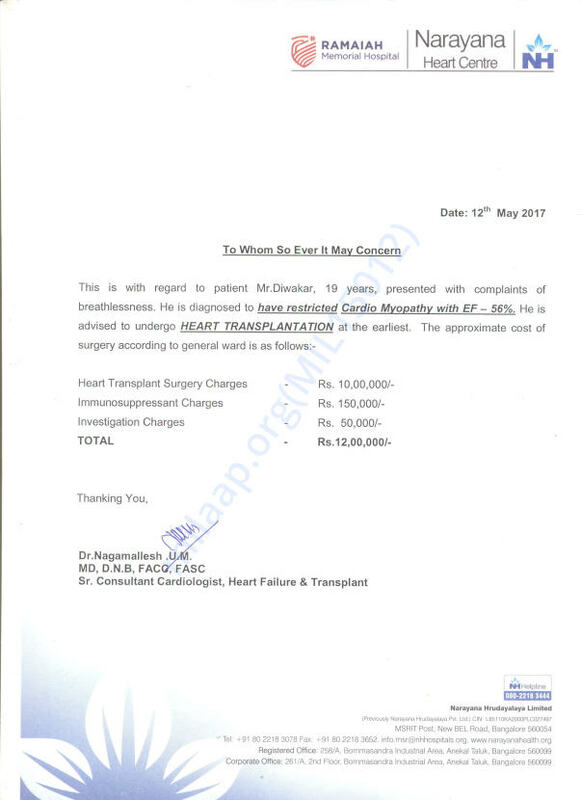 There was a positive match 20 days back but owing to his health and lack of funds, the transplant could not be carried out. The parents are trying every avenue possible to collect the required amount and go ahead with the transplant, once a positive match happens again. "We have approached a lot of NGOs, institutions, organisations to help my son and locate a donor. I'm still trying. Please share this with your family/friends/acquaintances so that Diwakar can have a normal childhood like other kids. ", Manohara.